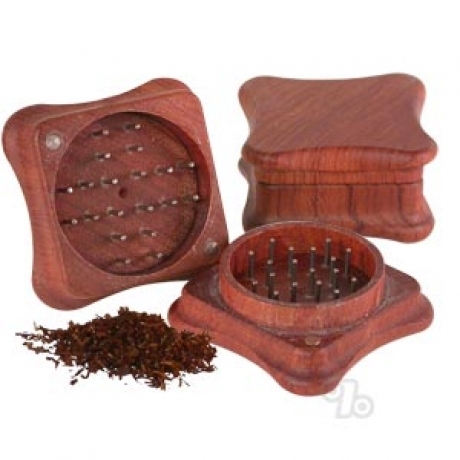 This fine Rosewood Herb Grinder with a unique shape is made from aged & cured plantation-grown rosewood, stainless steel pins, and magnets to hold it together. Offers an excellent ergonomic grip and is designed for the long haul. Guaranteed not to warp with regular use. Precision made by high tech machines instead of underpaid workers in developing countries. You can easily see the difference in quality. Includes drawstring cotton stash bag. Love the shape and the degree to which it works. No extra strain to get a good grind and it looks beautiful. This is the best grinder I've had. It holds a lot and is very stable. Nicely finished. Works Great and High Quality Wood !!! Well designed, and great looking Grinder in a beautiful wood design. Plus it's so simple to use. For arthritic hands, it is wonderful. This is a great deal. Works wonderfully.